[Source: blastr] Ms. Marvel and Inferno drop by Avengers Tower in a clip from "Marvel's Avengers: Ultron Revolution," airing Sunday at 8:30 AM ET on Disney XD! 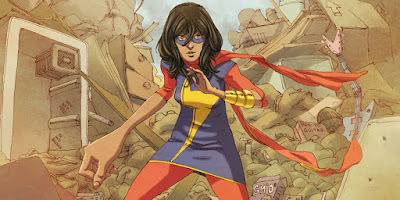 For a character who has only been around for just a few years, Kamala Khan is making quite an impression on the Marvel Universe — and is set to finally jump from page to screen this weekend. She will make her debut in animated form via a cameo appearance on the Disney XD series Avengers: Ultron Revolution. Even better? She’s (reportedly) set to join the (animated) Avengers full-time next season. The first clip finds Ms. Marvel fighting alongside Captain America and the Inhuman Inferno as they face off with comic baddie Ghost.